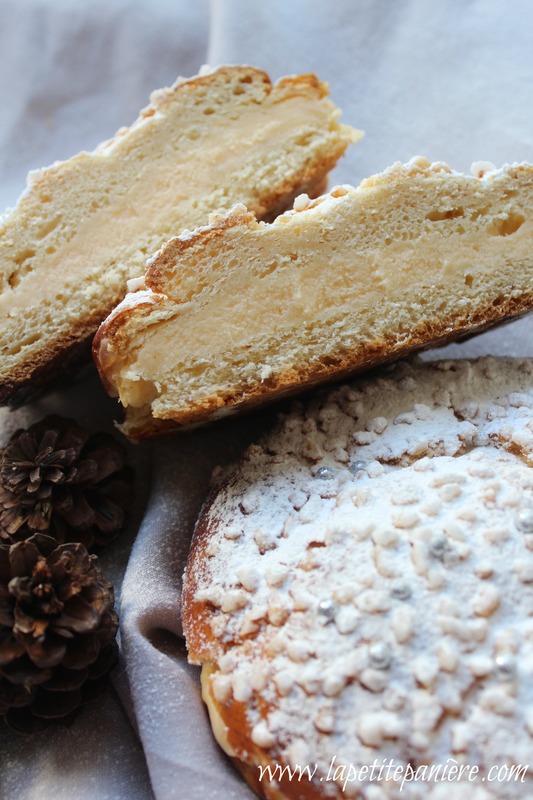 The Tarte Tropézienne is not a tart as indicated by its name, but actually, a Brioche cut in half and filled with a Cream au Beurre and flavored with orange blossom water. This dessert whose recipe is still kept a secret has an interesting story; it was created by a Polish pastry chef who opened a Patisserie shop in Saint-Tropez, and the name is said to have been influenced by the famous French actress Brigitte Bardot. For this recipe today, I used a Mousseline Cream. After co-hosting last weeks Fiesta Friday, I’m delighted to participate in the big, two-week celebration that is Fiesta Friday #100! Don’t forget to link up to this fiesta and participate with many other food lovers! A huge thank you to Angie for hosting these past 100 weeks, and to our wonderful co-hosts for this special event; Judi, Mollie, Steffi, and Suzanne. In a bowl crumble your fresh yeast and add 50ml of warm milk, and set aside for 15 minutes. In the mixing bowl of the stand mixer add the flour and the sugar. Add (into the mixing bowl) the yeast in the middle and the other side adds the salt. Start to mix the all the ingredients with the hook of your stand mixer on a low speed. Add the 4 eggs at the same time and now mix on a medium speed. Add the butter (cut into small cubes) and mix on a high speed until the dough becomes smooth and detaches from the bowl. Transfer the dough to a large bowl, cover with a clean kitchen cloth and set aside in a warm place for 1 hour. After 1 hour, transfer the dough onto a floured clean surface, push and knock back the air. Place the dough into the same bowl, cover with a plastic and refrigerate overnight (this will freeze the butter and develop aroma). The following morning, remove the bowl from the refrigerator and transfer the dough to the floured surface. Shape 5 round balls and flatten the top. Flour a large baking tray and transfer the 5 brioches on the tray. Let the dough rise for two hours. Brush each brioche with the egg yolk and sprinkle the top with pearl sugar. Bake for 30minutes (more or less depending on your oven). Ingredients: (for the crème patissière/pastry cream). On a medium heat bring the milk and the whipping cream to boil. In a large bowl add the sugar and the eggs, whisk until the mixture becomes yellow pale. Add the cornstarch and continue to whisk (the cornstarch brings a light texture to the cream). Slowly pour the milk and the orange blossom water into the large bowl and mix. Pour the mixture into a large pan and cook over a medium heat (whisk constantly until the cream becomes thick), remove from the heat and allow to cool. Mousseline cream is a combination of pastry cream and butter. Remove the crème patissière/pastry cream from the refrigerator. Whisk the crème patissière/pastry cream a little bit and set aside. In another bowl whisk the butter. Pour the whisked butter into the crème patissière/pastry cream and beat energetically until the cream becomes smooth and perfect. Cut the brioches in half (horizontally). On the bottom part of the brioche add the crème mousseline/mousseline cream with a spatula (cover the entire surface – and be generous). Place gently the top on the brioche. 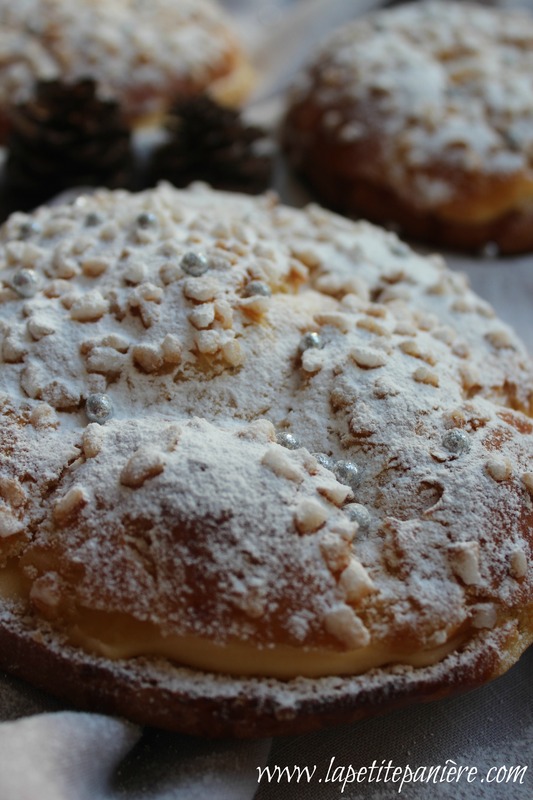 Dust with icing sugar and add some silver dragées for a more festive presentation. PS: If you use dry yeast follow the instructions behind your package! Also, if you have a brioche recipe already, you can also use it then add the pastry cream or mousseline cream to make your Tropézienne Tarts. So beautiful Linda, you are an amazing cook/baker everything you make is just perfection. Thank you for bringing this gorgeous tart to FF#100. Question, do I have to use fresh yeast? Can I use instant or quick rise yeast instead? If so does the amount change. Thanks so much. Thanks for the update on its origin!! Looks so delicious! Thanks for sharing this amazing recipe. J’ai beau vivre en France, je n’ai jamais goûté à la tarte tropézienne ! La tienne a l’air délicieuse, ça donne vraiment envie d’y goûter. Je suis sûre que la crème au beurre parfumée à l’oranger est un vrai délice. Meilleurs vœux à toi et à ta famille et Bonne année 2016. A bientôt pour de nouvelles recettes ! Merci beaucoup Darya. Vous avez la chance d’avoir de si bonnes choses en France; à chaque fois que je fais une escapade, j’avoue que je me régale avec plaisir. La tarte est très simple à faire et l’eau de fleur d’oranger donne vraiment un goût que j’apprécie beaucoup. always lovely Linda! your baking is so beautiful, different and just amazing looking! Thanks for sharing! Thanks for all those wonderful recipes you have been sharing with us at Fiesta Friday! So beautiful and sounds delicious, Linda! Another “recette extraordinaire”. 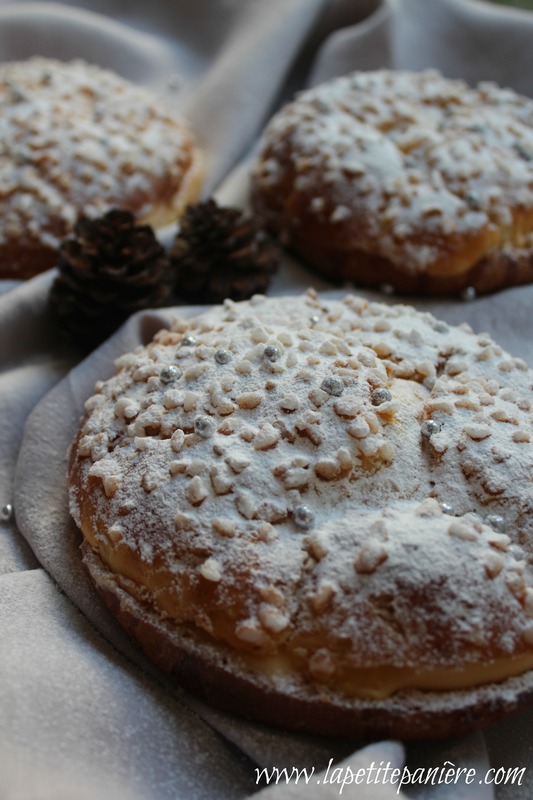 I think these would be a great treat for La fête des Rois. I am tempted by that orange blossom flavoured cream. Oh, Linda, how lovely and I can only imagine how good it is! I have a weakness with custard filled desserts and this is gorgeous! Happy New Year and Happy Fiesta Friday!! I’m pinning this to the FF Board just in case no one has yet! How lovely! I love brioche, but I’ve never made use of it as a tart, nor filled with such a lovely cream. I will have to try this sometime. Thank you for sharing Linda! Oh Linda, the recipe & tarts looked Amazing & that is Why, I ‘de them. It all turned out just wonderful. Itvwasxlso,sonfabulous & delicious too. X Happy 2016!!!! Wow this is truly lovely looking and sounds amazing! You are such an artist and an amazing chef Linda! Lovely! Ma sha Allah you’ve got so many new great recipes, since the last time I checked. Definitely a must-try! This is so unusual and so good Linda!!! Happy New year to you and happy baking always! Shukran kteer and do let me know how it turns out, InshAllah.